Evolavia is a low cost airlines of Italy with its base in Ancona, Italy. Evolavia operates scheduled flight services to several domestic destinations of Italy as well as international destinations. Book Evolavia flights ticket reservations online here. 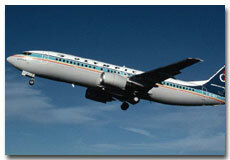 It is easy to get cheap flight tickets for Evolavia airlines online here. Founded in 2002, with its hub in Ancona Airport. Initially it started as virtual airline by sub contracting its routs.